Well to do a proper comparison you would also have to factor in the gains of real estate over that timeframe against inflation. The numbers aren't as pretty as you might expect. When you look at the early 1980's in Calgary I think an average house was say $150k? Today that average is generously say $500k...probably less really. So the compound growth is 3.5% over 35 years if you use those figures. Maybe I'm off on the number of years here or the $150k to begin, but from a pure investment perspective that puts you slightly ahead of inflation over the long term. Sorry, but what does paying off my mortgage have to do with house values? The return on paying off my mortgage is the mortgage rate, not the house appreciation, no? Yeah I guess I was looking at that from the perspective of comparing the investment in a house with the investment in the markets. If the choice is pay the house or invest though then the hurdle rate would be the interest rate for the mortgage, and that makes sense. 8% was the "rule of thumb" rate we used back when I took my finance degree and would have been the S&P500, not the TSX. Using your July 1979 date, this link shows an annualized S&P return of 7.9% when indexed for inflation with dividends reinvested. That's the S&P but your numbers still seem low for the TSX. I suspect 6.1% does not include dividend reinvestment. If you look up the TSE total return index that will show you the impact of reinvesting dividends. Cool, thanks for that link. Using that calculator, it shows 5% without reinvesting dividends. That's a good point though that you should include reinvesting. No, but hang on I think V has a point here even if you consider dividends reinvested. I think about this all the time and truly struggle with what to do with my excess money. Paying down the mortgage is a lower ROI but assumes NO risk. Investing in the market, even though demonstrated over the long run to generate approx. 5 or 8% ROI, still assumes risk. There's no guarantee that the stock market continually goes up and up and up. Wars, major global depression events, global stagnation... I believe there are threats to the conventional wisdom that investments in the index automatically earn you that 5 or 8%. That decades lasting forever into the future will automatically generate returns. It is possible the index or market dips, even for a prolonged period of time. Post World War 2 North American markets and economies are not the same thing as today's markets and economies, or the future's. For the risk weary, paying down the mortgage likely is still a good call. This is where it really depends on what your definition of risk is though. To me that means permanently losing the money. So paying the mortgage down saves you an obvious amount of money, that's true. But just like the index could dip for a prolonged period of time, so could a property. So in that case you've paid more into a property that has declined in value. I wouldn't consider that risk free, is all I'm saying. Paying off your mortgage has nothing to do with property value, though. Even if your place devalues to zero, you're still paying 3% on your borrowed amount. So paying off your mortgage is risk free savings on that mortgage interest, independent of your property value. Actually it has everything to do with paying off your mortgage. Think of it this way. You have a $300K mortgage on a $500K house. Lets assume your rate is 3% and amortization is 25 years. That puts your payments at $1,422.63 per month. In the first year that means you are paying $8,888.09 in interest and $8,183.52 in principal. For all intensive purposes you are paying close to $9K for borrow that money for the first year. Now, lets say you run into $300K immediately after entering into said mortgage and have the option of either paying off your mortgage (we will assume without penalty) or investing that in the market. We will assume the market will produce 8% in the same year. So for that extra $300K, you will assume roughly $24K. Alternatively you can chose to own your now $500K home. By paying off your mortgage you are saving the $9K in interest per year, compared to making $24K in the market. What would you rather do? Well now we have house appreciation come into play, along with factors such as risk of not meeting the mortgage payments (say you lose your job and it impacts cashflow). If your house is projected to increase to $700K over the next 2 years, sure, your $500K house you own today 100% after paying off the mortgage will year $200K/3 years = $100K per year. That is pretty good. However, lets say your house drops to $400K over the next two years (which is entirely possible here in Calgary). Well that's $50K lost each year in addition to the opportunity cost lost in being able to make $24K per year in the market. Short story is, when making these decisions, appreciation or depreciation of the asset that you are planning to own (paying off the mortgage is increasing ownership) entirely should impact your decision. At the end of the day, you have to look at the value of that property. Just like every other financial decision there has to be a "terminal value" or exit strategy where the underlying asset or capital must be considered. I can't believe you wrote "for all intensive purposes". Fair enough - I just cannot wrap my head around how the underlying value of your asset (house) cannot at least be strong determining factor in a financial decision such as paying off a mortgage versus keeping it invested in anything else. agree and disagree with parts of this but again you presume that the 8% is guaranteed in your analysis in the market investment. It's not a fair comparison because 8% is not guaranteed. The return on the mortgage payout is risk free. I don't think your analysis adequately considers risk. I completely agree - that was not the point I was trying to make however. All I was trying to say is that an analysis on whether to pay off your mortgage has to look at the value of your home. Unfortunately from a risk standpoint and what we are seeing in Calgary is people's portfolios largely consist of oil and gas companies as this is what this city knows. This results in a far too heavily weighted oil and gas portfolio coupled with Calgary home prices being directly tied to the health of the same industry. This is where people are finding themselves in big trouble as their job, investments and house were all attached to the same underlying commodity (no diversification whatsoever). Well that lack of diversity is a hard one to argue against when times are good here. I've spent many meetings explaining to people that they ought to invest elsewhere because everything they have is tied to O&G. I joke that some people say they are diversified because they invest in oil and gas! The problem is that when times are good there are more people than would care to admit that they want to "dance with the girl that brought them" along with a healthy dose of thinking they know a lot about the industry and are not going to fall victim to market declines. All of that said though, that in and of itself is not a reason to not pay down the mortgage. While it is true that house prices could take a significant drop due to the oil issues we see today, it really hasn't materialised thus far. Obviously housing has declined to some extent, and in some price brackets the declines are steeper. But overall it doesn't look like there are exactly screaming deals for houses either. I'm not a real estate expert in any sense, but it looks like prices have dropped maybe 5-10% on average? That is more of a correction than a steep decline that is cause for concerns. This is a very interesting topic and discussion. I hear what you're saying re: the stock market not being guaranteed, but I think that's a far too simplistic approach. You're completely ignoring opportunity cost of your capital and most importantly, you are taking a short term view. Yes, it's not guaranteed as you say, and there are certainly drawdowns. But to me the biggest true risk with investing in global markets is a) your own behavioural and cognitive biases, and b) the way the system is designed that completely misaligns owners of capital (you) with managers of your capital (topic for another time). More to the point, especially given that you can invest in this type of strategy for 0.25% or so these days, simply participating in global markets and adding when they drop will put you way ahead of paying off your 3% mortgage. Wouldn't the easy answer be to use the 24K a year to pay the mortgage down faster? 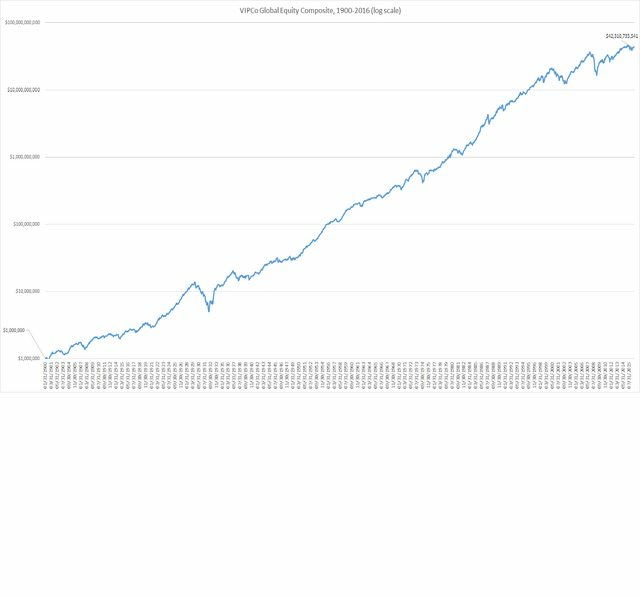 You say I have a short-term view and then show me a 115 year chart. How long are you planning on living? The great depression lasted almost a decade of stagnated or negative growth. Anyway I don't claim to know the answers, and certainly it is likely that buying an index and letting savings grow is likely the best plan, but I was just trying to point out that it doesn't mean it can't come with risk. And just because you show me a chart of 115 years, what did the past 400 years look like? Are you telling me that global economies are just forever up and to the right? Well like a lot of these questions, the best answer is to do both. It's good to have the mortgage paid down, and also good to save the money. There are advantages and drawbacks to each. If you need money after you put it against the mortgage it can be really difficult to get at it; you can't pull down your eavestrough to pay for an unexpected expense. However adding more to the mortgage payment means that through time your monthly cash flows are better because that expense is eventually gone. One of the challenges of planning in this area is discerning the goals and wishes of your clients. So while some people are both willing and able to put money in the market and wait out the potential volatility, others prefer to pay down the mortgage. If you look at any rolling 30 year period through this time, which is more realistic as to your point, annual returns vary between 8 and 14%. I don't claim to know the answers either, only my opinion based on data. If I were a betting man I'd say that paying off your mortgage in the long term is going to significantly underperform a global, diversified portfolio of financial assets at current rates. If you can't stomach volatility then that's a different story I suppose. Well you know that it comes down to both ability and willingness to take that risk though. So while it be perfectly sensible and might be the type of thing someone could handle financially if they're simply not willing to endure those ups and downs, or just "feel better" without that risk then that is the way you have to go.